Tired of motels and hotels? Enjoy Florida in the comfort and style only afforded with the space and amenities of a vacation rentals property in Longboat Key. Whether you seek beaches, waterfront or quiet island surroundings, allow yourself to be pampered. The homes, villas and condos on these pages provide an excellent sampling of "local living". Live among the natives but don't do without the modern conveniences, privacy, and comfort of your own home. Dock your boat and fish in the canal in your Longboat Key vacation homes backyard; walk the beaches at sunset; swim in your own pool; cook in the kitchen; snack when you want; watch TV and relax in the comfort of your "home-away-from-home". For the outdoor type and those who want to experience more, choose from boating, boat rentals, boat charters, fishing guides, ECO tours and a lot more; collect shells at the finest shelling beach in the world; visit some of our "eco-parks" or just spent some time on the trails at some of the beaches and remote islands. Many of our local restaurants offer steak, fish and shellfish at its finest. Many world famous theme parks are within easy driving distance and several state parks are located on the outer islands. Don't forget to visit one of the best national parks - Everglades National Park. 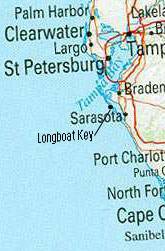 It's all available from the homes, villas and condos in Longboat Key.